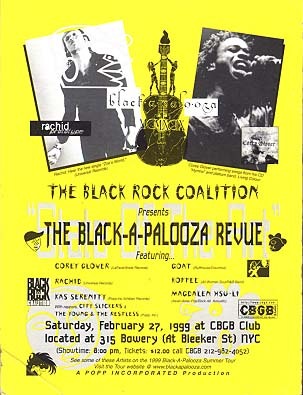 Created in 1996 and named with regards to alternative rock's Lollapalooza tour, Blackapalooza's mission was to provide a proper stage for the rebirth of Rhythm and Soul music that played with live bands. Today, the rebirth is complete and the result is a bull's run at the gate of pop music. Corinne Bailey Rae, OutKast, Jill Scott, D' Angelo, Fishbone, Macy Gray, Erykah Badu, Michael Rose, Lauren Hill, Maxwell, Living Colour and The Roots. These artist are combining platinum album sales and critical acclaim with numerous Grammy awards. Packing in arenas at African-American festivals as it travels across the country, BLACKAPALOOZA SummerJam 2000 has the current wave of bubbling Rhythm & Soul artist performing live and on stage. It's all about mixing the artists, musicians, festival attendees and summertime fun. Hot Fun In The Summer Time, Blackapalooza's Summer Jam is in this August issue of Vibe Magazine. Get Vibe at any your local magazine stores for more info.